Japanese Episode AG 031: "Muro Jimu Saisen! Nami Noru Batoru Fiirudo!" American Episode 303: "Just One of the Geysers"
Touki, the Muro Town Gym Leader, leads an eager Satoshi to the cave where the young trainer's rematch will take place. After an attempt from the Rocket-Dan to turn Touki's cave into their new Secret Base is thwarted, Satoshi and Touki are able to begin their battle. It's a two-on-two battle, and the first match sees Touki's Wanriki face off against Satoshi's Kimori. The gecko pokemon is able to dodge the fighting-type pokemon's attacks by jumping around the field, but before long Satoshi realizes that he can't keep this up forever. He calls his Heigani in, who is able to surprise Wanriki from underwater to score a victory for Satoshi. Next up is Touki's Hariteyama. Heigani attempts to launch an attack from under the water, but this time Touki's pokemon is able to counter with a powerful Seismic Toss attack. Satoshi's pokemon is KO'ed, so he's calls out his Kimori again. Satoshi develops a strategy where he has Kimori attack Hariteyama's legs, preventing it from fighting at full power. When geysers begin erupting on the battlefield, Kimori is able to use the power of nature to launch a final attack that defeats the large fighting-type pokemon. Satoshi wins his second Houen League badge! 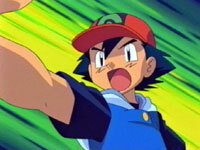 Satoshi congratulates his pokemon on a job well done as he says his farewells to Touki and Muro Town. The second Houen Gym Battle is finally here, and in my opinion, it was worth the wait. The outcomes of each battle weren't cheap or lame, and it was great to see Heigani shine in battle. I haven't been a huge fan of the episodes taking place on Muro Island, and I'm glad to see that Satoshi will get away from this place really soon. The dubbed version is pretty "meh" with one exception. During the first part of the Treecko / Hariyama battle, there's this really great piece of 4Kids-created background music playing that really impressed me. The song is actually really really good, and if I didn't know any better, I'd swear is was part of the original Japanese soundtrack (as in it actually uses a real orchestra instead of cheap synthesizers). Unfortunately, I've never heard the dub use this piece of music ever again, but I hope that someday 4Kids decides to dust it off and allow us to listen to it at least one more time. The first second is cut from the episode. Surprise surprise. The Rocket-Dan's flashback scene as to how they found their way into Touki's hideout is completely rewritten in the dub. Originally, we see the Rocket-Dan falling as they make an easily translatable play on words (parachute, parasol, and parasite). They fall through the hole, see the refrigerator, open it, and gasp in awe. It's a pretty standard flashback sequence. In the dub, the whole flashback is treated as if it's a random dream sequence instead. Instead of telling how Team Rocket wound up in Brawly's training space, the dubbed version has Jessie, James, and Meowth blather on about how they're "dreaming" about encountering their refrigerator for a second time. The dubbed version doesn't really make any sense, since it's obvious that the footage is supposed to be a flashback instead of a daydream taking place in present time, but I guess 4Kids was bored and decided to give me something new to write about. You know the drill: in the Japanese version, we see a bit of footage, then the show goes to commercial break, and when it comes back that same footage is replayed again. In the dub, that footage only plays once. This time, the footage in question is the footage right before the main commercial break that shows Satoshi worrying over the fact that Wanriki won't stay down. A second is cut from the TO BE CONTINUED... screen.